UMA president Ekwaro Obuku speaks during a meeting with MPs on Tuesday morning. Photo by Vincent Kasozi. KAMPALA–The president of the Uganda Medical Association (UMA) has called for the sacking of Diana Atwine, the Permanent Secretary in the ministry of health. Ekwaro Obuku who was meeting with MPs on the health committee of parliament this morning told the legislators that the PS is sabotaging government programmes. He accused Atwine of ordering for some Senior House officers in hospitals across the country to be denied their allowances despite a cabinet directive to equally distribute money that had been allocated for their allowances, there are 559 senior house officers. “How can a whole PS sabotage a cabinet decision? So as Parliament you should provide the checks and balances to put this person who is disorganizing the health sector in order, for us we are saying that this person should be fired yesterday,” he told MPs. Senior House Officers are Doctors under post graduate training at Masters Level to specialize in particular fields of medicine. Parliament appropriated Shs4.2b to cater for their allowances in the 2017/2018 financial year. He ridiculed the government’s plan to import doctors from Cuba stating that such a plan was bound to fail given the shortage of medical supplies and lack of equipment, an issue the government is yet to address. He noted that the Cuban doctors policy was a bad policy and Parliament needed to hold accountable those who give such wrong advice to the president. “Why don’t we just import a whole ministry of health also? Because they are failing, you people need to be very tough as accountability agents to the ministry of health……..so it’s very important that those who are advising him are up to the task.” He remarked. He revealed that Uganda graduates 150 specialists every year which specialists are snapped up by better paying hospitals and governments in the region. The meeting between the committee and UMA was called in order for the doctor’s association to brief MPs on the outcomes of the various negotiation meetings between the government and the doctors. On the 25th of November The Uganda medical association agreed to call of a strike that had lasted three weeks and paralyzed services in government facilities. The doctors agreed to resume work until the December 16, when they expect to conclude negotiations with the government on the demands to improve the general welfare of medical personnel. 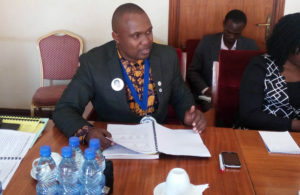 The Chairperson of the committee Michael Bukenya noted that the MPs needed to capture all the points that had been agreed upon between the two parties so that they as MPs can execute their role in pushing for the various allocations to the health sector. Obuku stated that if the promise of Shs5.5m as a starting salary for the lowest paid doctor is fulfilled and duty allowances are enhanced then the association will ensure that doctors employed by government do not carry out dual practice by offering their services in private clinics as is the norm today. Obuku also called for the re-introduction of user fees in hospitals while observing that citizens are always willing to pay for services. He suggested that the fees be streamlined such that the poor are able to afford the charges while more affluent citizens cover the cost of the poor. Obuku pointed out that the biggest funder of the health sector is the patients who pay more from their pocket than even the donors. “The biggest contributor to the total health expenditure is the people paying for themselves, if they don’t pay in a government hospital they will pay in a private clinic or even a traditional healer.” He observed. He remarked that there is need for a major reform in the health sector in order to improve service delivery, he applied the example of the national army the UPDF noting that the only way the army was able to become one of the most respected armies in the region was through major reforms. He says that if the promises form the government are not fulfilled the association is planning a longer strike of about three months. “We actually carried out this industrial action not for the first time, if the powers that be do not listen we are planning a proper one, a proper one for about three months, we want to change the health sector totally,” he announced.